The Rockies offer an incredible selection of outdoor adventures throughout the year, from hiking, mountain biking and fishing in the summer to skiing and snowboarding in the winter. Visitors can admire diverse fauna and flora, from rare birds and mountain flowers, to big animals like moose, grizzly bears and bighorn sheep. Our list includes a diverse selection of places to stay, including lodges, hotels and inns close to Rocky Mountain National Park in Colorado, Glacier National Park in Montana, and Yellowstone and Grand Teton in Wyoming. Here are some of the best mountain vacations. The Lodge and Spa at Brush Creek Ranch in Saratoga, Wyoming is an all-inclusive getaway with 39 lodge rooms and cabins that can accommodate up to 150 people. The Trailhead Spa offers massages, skin treatments, and salon services. Guests can work out at the fitness center, relax in the saunas, steam rooms, and an outdoor hot tub. There is an excellent equestrian center and yoga classes. Guests can gather around the fire pit, in the dance hall, or gear up for adventurous outings. There are several dining venues in the Lodge, including the Trailhead Great Room, which offers multi-course meals, a full bar, and the warmth of an open-hearth fireplace, and the Chuckwagon, which offers family styled meals including a barbeque. The Saloon is the place to watch TV, play billiards or poker, or show off your singing abilities at karaoke. All of the rooms have Wi-Fi access, coffee stations, plush robes, 400 thread count sheets, and a majestic view of the mountains. All-inclusive rates start at $700 per person. Surrounded by theColorado Rocky Mountains, Della Terra Mountain Chateau is an enchanting lodge that promises a magical mountain escape throughout the year. 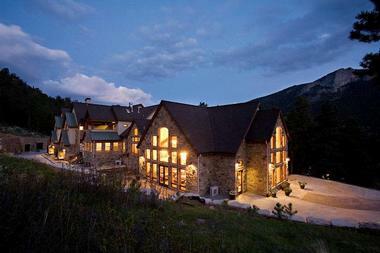 Located in Estes Park at the entrance to Rocky Mountain National Park, the chateau rests at the top of the wooded acreage and boasts stunning views over the valley. Fourteen romantic suites have spacious living areas with arched windows, snug sitting nooks, and wood-burning fireplaces. 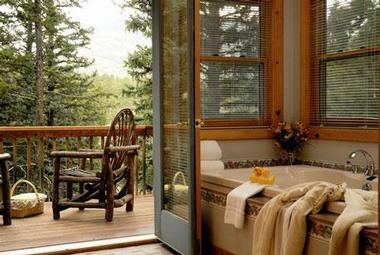 Guest bathrooms have large rain showers and soaking hot tubs with décor inspired by the surrounding nature. The chateau has an inviting lounge with a vast three-sided stone fireplace and waterfall, a comfortable library and theater room, private spa treatment room, and dry heat sauna for absolute relaxation. Glacier Under Canvas is a luxury camping experience located just seven miles from the astoundingly beautiful Glacier National Park in Montana. Though accommodations are in the form of tents, they offer a level of comfort that will astound you. Guests can truly experience and enjoy the wild without having to give up the satisfying comforts of home. Plush camping tents have raised wooden floors, cozy bedding, and even private bathrooms with showers and baths. Choose from a standard camping tent, a deluxe tent with a tipi, a log cabin, or a tree house – there is a retreat for every taste. 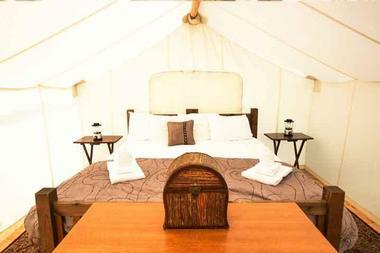 Tents have roomy living areas, fresh linens and splendid views of the surrounding natural landscape. Some even have wood-burning fireplaces, king-size beds, and carpeted floors. Take a scenic drive through some of the world’s most beautiful countryside and explore over 700 miles of trails in Glacier National Park where you can hike, bike or horseback ride, head to the lake for some fishing, or try whitewater rafting on the Flathead River. Glamping rates start at $95. Viceroy Snowmass is a luxurious hotel in the heart of the Rocky Mountains that offers sophistication and style at the base of one of the world's best ski mountains. Featuring deluxe ski-in/ski-out luxury resort lodging, a spa, and an array of adventures and activities for the whole family, this hotel is the ideal place for a mountain vacation any time of the year. Custom-designed interiors combine with modern amenities and finishes in the resort’s 173 exceptional accommodations to provide tranquil and exclusive retreats. Full or convenience kitchens, gas fireplaces, private sundecks and state-of-the-art technologies such as wireless Internet provide absolute comfort, while in-room spa services, personalized meal preparation, and 24-hour in-room dining allow guests to indulge themselves and can be arranged upon request. Participate in a wealth of outdoor activities throughout the year, from hiking, mountain biking, fly-fishing, horseback riding, and attending festivals and concerts in the summer to wintertime skiing, snowboarding, ice skating, and sleigh rides. Rooms start at $215 per night). You may also like: 25 Best Things to Do in Aspen. 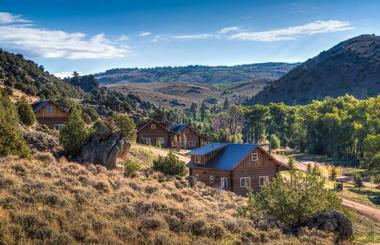 Escape into the middle of nowhere with a stay at the J Bar L Ranch in Montana. Tucked away in the midst of the Centennial Valley near Rocky Mountain National Park, the J Bar L is a holistically managed grass-fed beef ranch that offers fully-restored rental homestead cabins, exquisite farm-to-table dining, and an abundance of outdoor activities. Beautifully restored rustic and elegant cabins feature spacious rooms, private bathrooms with hot tubs, and luxury amenities, including fully stocked kitchens, gas stoves and grills for outdoor cooking, and in-room laundry facilities. Backpacks, hiking maps, and binoculars are available for guest use to explore the magnificent surrounding landscape. 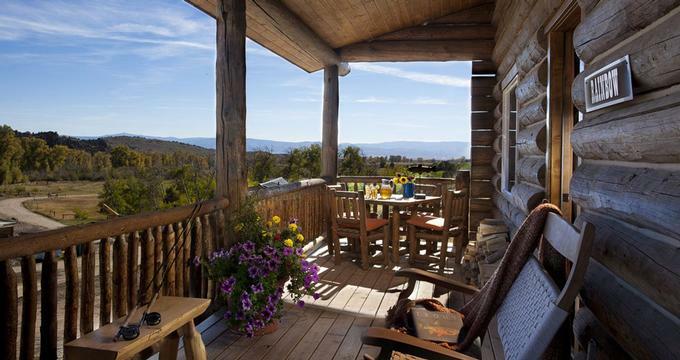 Triple Creek Ranch in Darby is luxury wilderness hideaway with a choice of three bedroom cabins and ranch homes. All of the cabins are spacious and styled in a rustic manner, complete with bathrooms and sitting areas. You’ll never run out of things to do here – you can take advantage of massages, a pool, a tennis court, and a fitness center. Guests can also enjoy horseback riding, fishing, sled dog treks, and helicopter tours arranged by the Ranch. The restaurant provides guests with an elegant formal dining experience, complete with salads, duck breast, Alaskan halibut, and mousse. The Rooftop Lounge offers a more relaxing atmosphere for mingling, and serves cocktails, beers, and wine. Have a drink and relax by the fireplace or on one of the decks. Four-night romantic packages start at $5,530. Located close to Estes Park in Colorado and just minutes from Rocky Mountain National Park, Taharaa Mountain Lodge is an exclusive and inviting bed and breakfast-style lodge. This beautifully appointed retreat features attractive and lush accommodations in the form of nine standard rooms and nine suites, all of which have comfortable décor and furnishings, bathrooms with showers and soaking tubs, and cozy fireplaces. A delicious home cooked breakfast is served every morning, and a variety of dining options and evening entertainment is available in the nearby town of Estes. Visitors flock to this glorious part of the world to take in the great outdoors and all the activities it has to offer. From over 355 miles of hiking, horseback riding, and mountain biking trails to countless rivers that allow water sports, fishing, and kayaking, Estes is a thrilling place that also offers an array of fun summer festivals, outdoor events, and fairs that celebrate the region’s rich history. Rates start at $209 per night. The Inn at Lost Creek is a luxury boutique hotel with luxurious accommodations, one of Telluride’s finest restaurants, and superior service in an unrivaled location. Intimate, elegant lodging is comprised of 27 luxury suites and five fully equipped studios, each of which is decorated with natural materials of wood and stone and fitted with unique, handcrafted furnishings. Suites are complete with kitchenettes, private balconies, bathrooms with steam showers and spa tubs, and cozy fireplaces. Resting slope side on Sunset Plaza in Mountain Village, the Inn offers an array of both elegant and casual dining options, world-class shopping, and countless other activities, including skiing, snowboarding, and Heli-skiing in the winter and biking, hiking, horseback riding, and golf in the summer. Rates start at $180. Located near Grand Lake in Colorado, the Winding River Resort is a family-friendly mountain resort surrounded by the heart-stopping beauty of the Arapahoe National Forest and Rocky Mountain National Park. The resort offers guests a variety of comfortable accommodations, ranging from cozy log cabins and lodge rooms to roomy RVs and neat campsites with tents for camping. Inviting décor in natural materials, gas fireplaces, and small kitchenettes create a home-away-from-home atmosphere while private porches enthral guests with perfect views. The spectacular mountain setting of the resort presents a range of outdoor activities, including hiking, horseback riding, and snowmobiling, while the nearby Grand Lake, Lake Granby, and Shadow Mountain Lake are ideal for watersports such as fishing and boating. Chico Hot Springs Resort & Day Spa in Pray, Montana has 48 rooms in the main lodge, comfortably furnished with gorgeous antiques. Most rooms are supplied with sinks while thirteen of the rooms have a full private bath. There are thirteen different wings, each with a variety of rooms to suit each individual guest’s needs. Visitors can treat themselves to a trip to the day spa and indulge in services such as massages and body wraps, or they can soak in the natural hot springs pools. The resort has its own horse barn, and visitors are able to go on trail rides. If horses aren’t appealing to you, don’t worry – ski and snowshoe rentals, rafting, dogsled treks, and a lush garden are all available to guests as well. The Dining room serves fresh cuisine and fine wines nightly and breakfast in the mornings. Sunday is a special day because guests can enjoy a delicious and hearty brunch. The Poolside Grille offers pizza, burgers, and beer, while the Saloon offers a variety of drinks and a pool table and televisions for entertainment. Rates start at $61. Grand Lake Lodge is a beautiful summer mountain lodge overlooking Grand Lake and Shadow Mountain Reservoir that dates back to 1920. Located next to Rocky Mountains National Park, rustic log cabins offer a unique experience, complete with cozy fireplaces, traditional décor, and private porches with spectacular lake views. The main lodge features a stylish lobby with a circular fireplace, hickory rocking chairs, and porch swings where guests relax and take in the scenic vistas. There is a warm and welcoming restaurant that serves a breakfast buffet and a very popular Sunday Brunch. The dinner menu offers delectable cuisine with prime-cut steaks, fresh seafood dishes, and an extensive cocktail, beer, and wine list. Activities in and around the lodge abound, with hiking and camping, mountain biking, horseback riding, golf, boating, whitewater rafting, and fishing. The small mountain lake town of Grand Lake offers a nice selection of shopping. Rooms start at $140 per night. Resting on a sprawling 37,000-acre authentic working cattle ranch in western Montana, The Resort at Paws Up offers an incomparable experience in the heart of an incredible, unspoiled wilderness. The Ranch features superior accommodation, ranging from private homes to astoundingly comfortable tents, as well as gourmet cuisine, a deluxe spa, and outstanding personalized service. The tastefully arranged residences are replete with modern amenities. The rooms have the perfect amount of space, and the en-suite bathrooms include indulging features such as hot tubs, rain showers, and heated flooring. In-home laundry, flat screen televisions, and high-speed wireless Internet complete the picture of absolute comfort at this resort. Spend time enjoying the great outdoors by participating in authentic Montana dude ranch activities like trail riding, taking a jaunt in a chuck wagon, and going on cattle drives. Try your hand at fly-fishing on the legendary Blackfoot River, clay target shooting, whitewater rafting, horseback riding, or cross-country skiing. Rates start at $1,780 per night. Brooks Lake Lodge and Spa in Dubois is a lovely Rocky Mountain getaway with rustic cabins surrounded by unforgettable scenery. There are seven lodge rooms and eight cabins available for rent, all of them arranged with wooden furniture and western décor. 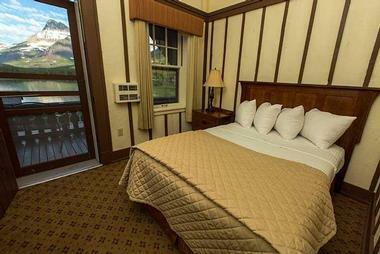 The amenities in the guest lodgings include Wi-Fi, a wood burning stove, and beautiful views. Romantic River Song Bed and Breakfast in Estes Park provides a beautiful and romantic spot to which couples can slip away and unwind. The inn sits on twenty-seven wooded acres and has ten spacious guest rooms, each with its own design concept. All of the rooms have private baths with large tubs and showers, fireplaces. Most rooms have the added luxury of heated flooring. Guests are welcome to frequent the common rooms for reading, mingling with other guests by the fireside, playing a game of chess, or just relaxing. They can also get streamside massages for two, bird watch, go fishing, hike the River Song trail, play lawn chess, or have some fun swinging on the tree swings or stargazing. A full country breakfast is served each morning of your stay, and afternoon tea and baked goods are also available. The restaurant at the Inn serves truly delicious food and wine. The bone china and the room’s commanding fireplace add just the right touch of sophistication. Rooms start at $199. The Izaak Walton Inn and Resort in Essex is the perfect place for outdoor adventure and relaxation. The Resort has lodge rooms, cabins, and even cabooses for guests to stay in, each unit providing space for a different number of people. The cabooses offer a bathroom with a shower, a kitchen, and a deck, and all rooms have private baths within the lodge rooms. No cell phone service or TV is available at the lodge, but payphones and complimentary Wi-Fi are available at certain locations within the main building. 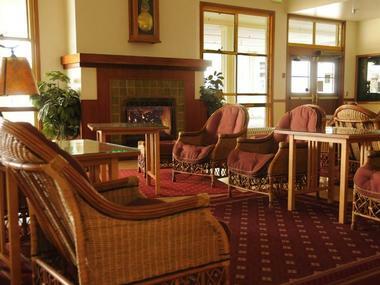 The resort offers white water rafting, skiing, snowshoeing, and guided tours. The restaurant at the Lodge has great breakfast and dinner menus, with classic entrees such as buffalo meatloaf, stuffed chicken, and lamb chop, as well as cocktails and ale. A bar area is also open for use, with cocktails and hot specialty drinks such as Izaak Irish Coffee and the Montana Mudslide. Many Glacier Hotel in Babb promises guests breathtaking views and unequalled experiences in the “Switzerland of North America”. The hotel has five stories with a total of 215 guest rooms. All of the rooms include a private bath, direct dial phones, double or twin beds, a coffee maker, down alternative pillows, stationary, and limited Wi-Fi. For guests wishing to satisfy an adventurous appetite, the hotel offers Red Bus tours, horseback rides, ranger programs, and boat cruises. There are several other lakeside activities guests can check out, and of course they can always stop by the gift shop. The Ptarmigan Dining Room has serene lake views and provides delicious nourishment for breakfast, lunch, dinner, and dessert, including a great kid’s menu. The Swiss Lounge on the other hand offers guests a more casual dining experience, and they can grab a quick bite to eat before adventuring in the park. Heidi’s Snack Shop & Expresso Stand is another good place for guests to fuel up before heading out. Rooms start at $165. Glaciers' Mountain Resort is an exceptionally appealing destination just five minutes from the Glacier Natural Park entrance. The cabins on the property have one bedroom and a queen size bed, and they can be set up to accommodate two extra guests. The cabins all have a full kitchen, a bathroom, natural gas fireplaces, air conditioners, ceiling fans, free Wi-Fi, and a snack basket. There is no shortage of occupations here. Guests can participate in river rafting, biking, backpacking, hunting, fishing, and horseback riding during warmer months. Activities held during cooler months include skiing, snowshoeing, ice fishing, and riding snowmobiles. As full kitchens are in every cabin, guests can bring their own food to cook, or they can head to the nearby town to find restaurants for casual or fine dining. Guests can also find shopping and other sightseeing opportunities in town. 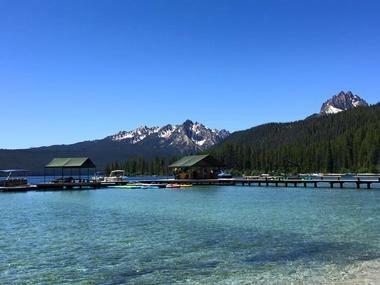 The Stanley Riverside Motel in Standly, Idaho has lovely scenery in which visitors can pursue a variety of outdoor adventures at the Sawtooth National Recreation Area. The motel has both rooms and cabins available, all of which have a kitchenette area and necessary cooking utensils, a dining table, and satellite television. The rooms are spacious with a rustic allure and captivating views, and the cabins have porches allowing guests to sit outside and relax. As far as outdoor activities go, options are limitless. Guests can enjoy camping, fishing, biking, skiing, snowmobiling, boating, canoeing, rafting, hiking, and backpacking. Rafts, kayaks, and canoes can all be rented on site, and amateur and professional photographers will both be thrilled by the picturesque scenery. There is not restaurant on site, but there is a kitchen area for guests to cook their own food. Shops and grocery stores, as well as restaurants, can be found in town. Rates start at $135 per night. 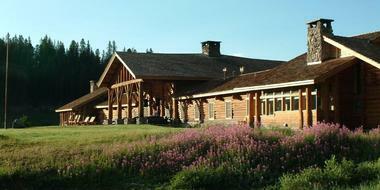 Three Bear Lodge in West Yellowstone is an eco-friendly lodge located near the entrance to the park. 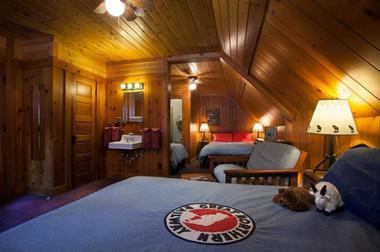 The lodge offers both premium lodging and standard rooms, all with a homey and rustic ambience. The rooms all have refrigerators, microwaves, 32” flat screen LCD TVs, free Wi-Fi and some offer Jacuzzi tubs. The guests are welcome to swim in the pool and have a soak in the hot tubs at the lodge. They can also take a look around the gift shop or take younger vacationers to the kid’s “rock”reation area. A fitness center and spa is also available for use in the lodge. The restaurant at the lodge offers breakfast, lunch, and dinner in a cozy setting and is one of the few places in the town to have a kid’s menu. Guests can also check out the Grizzly Lounge for an appetizer, drinks, or just to relax and watch the big screen TV. 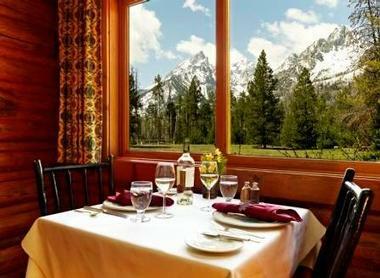 Jackson Lake Lodge offers striking views of Grand Teton National Park. Choose from 385 rooms, including spacious suites. Guest accommodations have phones, complimentary Wi-Fi, hairy dryers, ironing boards, and coffee pots, but in keeping with a more traditional experience with nature, no televisions, radios, or air conditioning is available. Guests can, however, enjoy a heated swimming pool, retail shops, and adventure outfitters. Visitors can go on arranged tours of the park, river trips, and trips into nearby Yellowstone National Park. Inside the lodge, the Mural Room provides beautiful panoramic views of the mountains from huge windows. The restaurant serves salmon, fresh bread, local buffalo, and huckleberry accented foods. The Pioneer Grill has a marvelous 1950’s style atmosphere with hot sandwiches, chili, and buffalo burgers, with takeout service available. They serve breakfast, lunch, and dinner at the Grill. Mammoth Hot Springs Hotel and Cabins in Yellowstone National Park is a fantastic place for park visitors to stay during their trip because of its central location. The hotel has rooms with optional private baths and cabins with optional hot tubs. All of the rooms have a telephone and sinks, while the cabins feature private baths, but no telephones. Televisions, radios, and air conditioning are not available in the lodgings, but you probably won’t be spending much time in the room anyway – there’s way too much to do here. The hotel offers ski and snowshoe rentals, tours, snow coach shuttles, horseback riding, wildlife watching, hiking, and bus tours. The Terrace Grill has a quick-service menu for breakfast, lunch, and dinner and is perfect for adventurers who are on the go. The Dining room offers a causal and more tranquil setting for guests to sit and enjoy bison sliders or wild game meatballs. There is also an excellent breakfast buffet available in this restaurant. 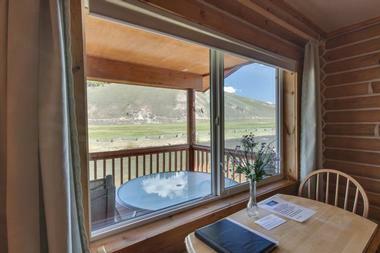 Redfish Lake Lodge in Stanley offers cabin lodging for guests who want to spend time in the great outdoors. There are 40 cabins, decorated in different themes. Each cabin has a bathroom, a refrigerator or kitchenette, and most have a fireplace as well. The units are not equipped with televisions or telephones in order for guests to have a more authentic experience in nature, although there is Wi-Fi at the lodge. 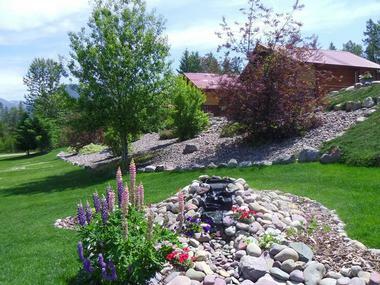 Guests can also rent bicycles at the lodge and go mountain biking, try out their mountain climbing abilities on the Sawtooth Mountains, enjoy hiking on the hundreds of miles of trails, or play boche ball. Boat rentals and scenic lake tours are also available, and there are plenty of great fishing spots and places to enjoy a nice swim in the crystal clear Idaho waters. A traditional Northwestern breakfast is served every day of the week in the main dining room. Guests can also relax with a drink in the Rustic Lounge, or enjoy burgers and sandwiches in the outdoor gazebo. Rates start at $69. Granite Park Chalet in West Glacier is known for its quiet country environment and its prime location at Glacier National Park. The Chalet has a total of 12 rooms, some of which can accommodate up to six people. Each room has single bunk beds with comfortable linens and a cozy atmosphere. Guests can enjoy hiking and horseback rides on the trails, with an interpretive hike available. For those who want to take some time to buy souvenirs, the Grizzly Goat gift shop is open and available to them. A pre-order menu option is available for guests who do not want to bring their own meals. The menu offers guests many different choices of food and tableware, from sliced fruit and trail mix tubes to breakfast biscuits, mashed potatoes, chicken vegetable soup, and heart stew with beef. Best of all, the food will be waiting for guests right when they arrive.